Thursday, 19 February marks the beginning of The Chinese New Year, a celebration that lasts from the new moon to the Lantern Festival 15 days later. Much of what I know about Chinese New Year I learned from chatting with Sachiko Saeki, a chef who was Hugh’s sushi tutor on River Cottage, and who frequently hosts regular cooking courses at Demuths Cookery School in Bath. 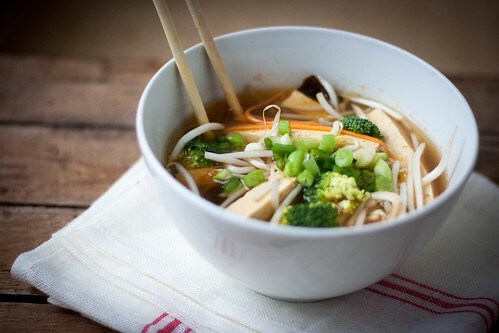 In this spirit of renewal and cleansing, I like to mark the Chinese New Year by making this Vegetarian Hot & Sour Soup, a bowl of comfort that keeps the body and soul warm during these last days of winter, but also harkens of the coming spring with its fresh flavours and colourful vegetables. This soup isn’t just for Chinese New Year, it’s really for any time of year when you need a nourishing pick-me-up. It’s a very easy soup to make and can be adapted to suit whatever vegetables you have to hand. I especially like mine with lots of carrots and broccoli. vegetables: carrots, courgettes, broccoli, seaweed, mushrooms, whatever you have! Cook the noodles according to the packet’s instructions. When finished, rinse under cold running water and drizzle a little oil over them to keep them from sticking together. Divide between two big bowls. In a soup pot, combine the ginger, red chilli, Shaohsing rice wine, vegetable stock, soy sauce and rice vinegar. Bring to a simmer. While the soup simmers, prepare your vegetables. I like to julienne my carrots and courgettes, but feel free to cut them to your preferred daze and shape. Add the vegetables to the pot and let it come back to the simmer. Cook until the vegetables are tender (any quick-cooking vegetables, especially greens, should be added at the very end so they don’t over cook). Stir in the bean sprouts, most of the spring onions and the tofu. Ladle the soup over the noodles. Serve garnished with spring onions. Snap! We have so gone with a similar vibe for CNY! 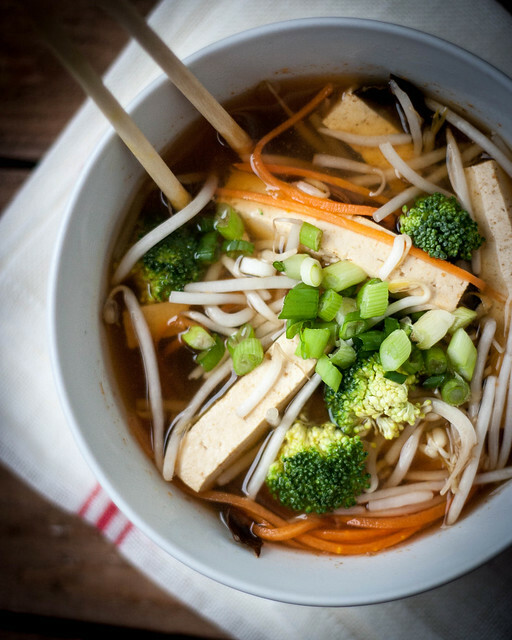 Nothing beats a slurpy spicy bowl like this – yum! Mmmmm, the combo of chiles with ginger sounds perfect! I would love this…. Give it a go – it’s super easy to make!